Come explore the vacation paradise of the Bahamas Exumas and Out Islands! The crewed sailing yacht Rubicon offers the perfect way to enjoy your Bahamas vacation. This spacious 44ft catamaran offers the best of everything that makes a yacht charter vacation great: beautiful, comfortable accommodations, an expert and enjoyable crew, fabulous food, and so many fun things to see and experience. Rubicon's interior decor is casual elegance with shiny wood paneling. Photographs shot from the owner's family world cruise enhance the staterooms, creating a wanderlust feeling to sail to remote regions of the globe. There are many enjoyable places on board to enjoy! The main salon, cockpit, and forward trampolines are the main gathering areas for meals and activities. The trampoline area is the optimum place to hang out while underway, enjoying the salt breeze and luscious scenery of the islands. Catamaran Rubicon is run by a professional captain and chef. 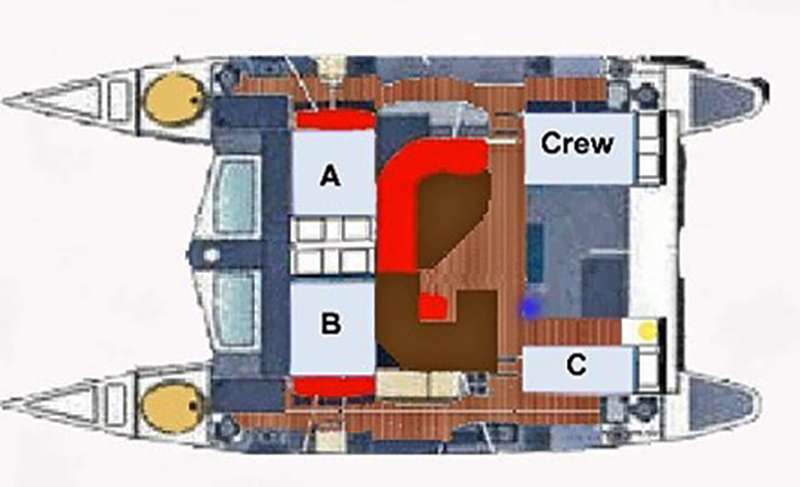 It is the perfect yacht for a group or family vacation. Among her many possible activities are kiteboarding and surfing. You may also participate in eco adventures including feeding swimming pigs, snorkeling, kayaking, hiking nature trails, sailing and enjoying remote beaches. Rubicon has charcoal filtered Reverse Osmosis water which is high quality and avoids all those plastic bottles. Rubicon has re-usable Tervis tumblers instead of bottles. If you wish to "go green" and help the environment, you are welcome to turn off the A/C and experience the breezes from the tradewinds as with open hatches and electric fans they are usually quite sufficient to keep you cool. Becky spent her childhood in London, her teens and early 20s in Donegal, on Ireland’s rugged, northwest coast, and summers with Dad and his family in Spain. She did a lot of amazing things. Her very hardy life” on a small Irish island in the North Atlantic required commuting by rowboat in very cold, rough water. She worked with the Irish Civil Defense ambulance emergency team. She helped a master boat builder construct a Viking ship. She achieved diplomas in holistic massage, anatomy, and physiology, reflexology and courses in Reiki. Becky says, I love fresh, healthy food, especially colorful vegetarian dishes with delicious sauces, and Mediterranean cuisine. Guests rave about my homemade bread, tasty pastas, fresh fruit salads, cakes, and puddings.” In addition to cooking great meals aboard SWISH, Becky might find time to chat about her family’s 1911 50-foot Norwegian gaff-rigged ketch, or her three Atlantic crossings, or the big posh yacht in Guatemala with an owner who accidentally threw himself overboard. With Becky as your chef and hostess, your charter adventure in the Bahamas could include delightful ingredients you never even imagined. Vrinda, who prefers to be called Vrin”, is passionate about the ocean and yachting. She spent two years preparing her favorite recipes for delighted guests on a charter catamaran in Costa Rica. She says, I love fresh sea food, organic fruits and veggies, gluten-free crepes, Latin food, conch fritters and Venezuelan breakfast arepas.” In fact, she is so enthusiastic about serving great food to her guests that she is in the process of establishing a boutique restaurant in her childhood home. Charter guests aboard Rubicon can look forward to Vrin’s excellent and innovative cuisine. In addition, water sports enthusiasts of all skill levels have will have the time of their lives. When Vrin can get out of the galley, she’s always happy to help guests get the most out of the yacht’s toys and gear. Her energy and attitude are perfectly consistent with her motto: Wealth is the ability to fully experience life.” Charter Rubicon with Chef Vrin and Captain Adam for an unforgettable life experience. Contact us for rates and current availability or to book a charter aboard Rubicon! Our crewed, inclusive Bahamas sailing charters include breakfast, lunch, dinner, snacks and drinks &#47; bar. We will accommodate special diets (diabetics, vegans) with prior notice. Fresh bread is prepared daily in time for an evening twilight dinner. We had an amazing time. Adam and Jen were exceptional - super friendly, attentive, and very accommodating. They made sure my family and I had the best time. Rubicon was clean and well-ventilated; beds were okay in terms of comfort. We loved hanging out on the back part of the Rubicon and also the front on the trampoline. For the most part food was delicious. My sons are picky eaters so Jen did a good job of making things for them that they would eat. They really liked the chocolate pancakes and gluten free biscuits. Our sailing itinerary was perfect! Adam took us around to some of the most beautiful places I've ever seen and made sure the boys were engaged early in the day to keep them busy; he also did a great job of finding good places to go spear-fishing as that was the highlight of the trip for my husband. We had the best time sailing the Exumas on the Rubicon - the trip exceeded our expectations. We will definitely remember this trip as it has made a lasting impression on my sons - they loved every minute of it! Captain Adam the best - he was great with the kids - couldn't have asked for a better captain! The crew was friendly, knowledgeable, attentive and accommodating. I cannot sing my praises high enough for Adam and Tina. Adam was a highly skilled captain with excellent knowledge of the area we cruised. He knew when and where to go for drift snorkeling, and as a result our snorkeling experience was better than any previous trip. Tina was a friendly and joyful host. Very happy with Sailing Directions’ service.